POOPY POUCH CHIPBOARD BOX contains 200 "generic" Doggy Poo Bags. This box is specially designed to work with other chipboard box dispensers and our new Universal Station #PP-UNIV-03L. Just punch out the serrated opening and insert the box directly into the dispenser. Cleaning up after our dogs is the responsible thing to do, and POOPY POUCH DOGGY POO BAGS are the easiest way to do it. Desgined with you in mind, these easy-tie bags are perfect for pet waste. Non-toxic, lemon-scented Poopy Pouch bags lock in wetness, odor, and soil. They won't leak or break, and their green earth color was designed to camouflage the bag's contents. What a great way to keep your corner of the planet nice and clean! 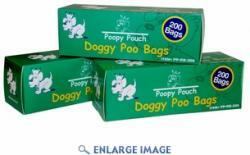 Dogs love our POOPY POUCH DOGGY POO BAGS, almost as much as their owners do.